One of the most powerful ways to market your small business and develop relationships with your customers is through the mailbox. 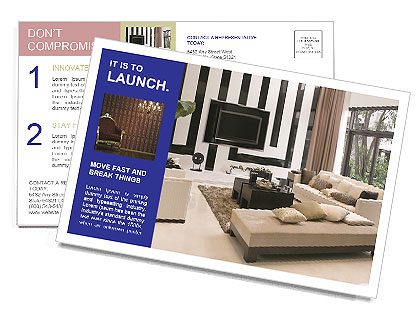 Postcards allow you to reach a targeted audience with brochures, catalogs, coupons, and more. 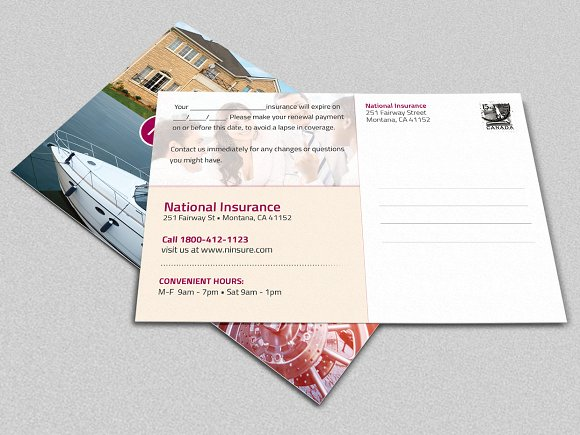 To print and mail your postcards, consider Cardigent’s Intelligent Postcard Delivery. Cardigent can help you with your direct mail marketing campaign by blanketing specific zip codes with your postcards, helping your business generate new customers and lowering your acquisition costs. Pricing starts as low as 19 cents per card. 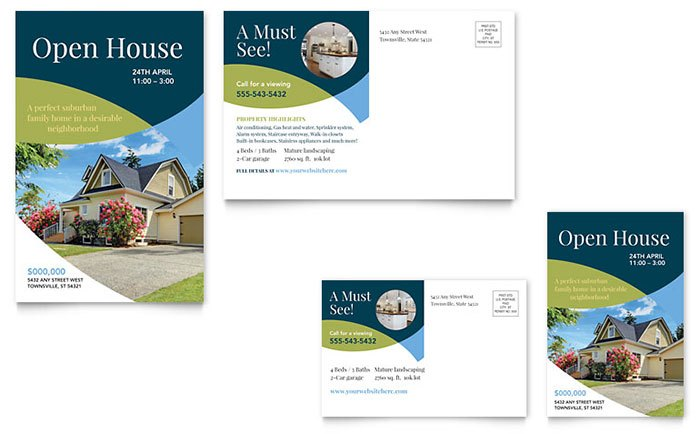 Once you’ve got your design all set up, make sure that your postcards are professionally printed with Vistaprint. Vistaprint is the business card and postcard provider of choice for small businesses with its affordable price and great turnaround time. 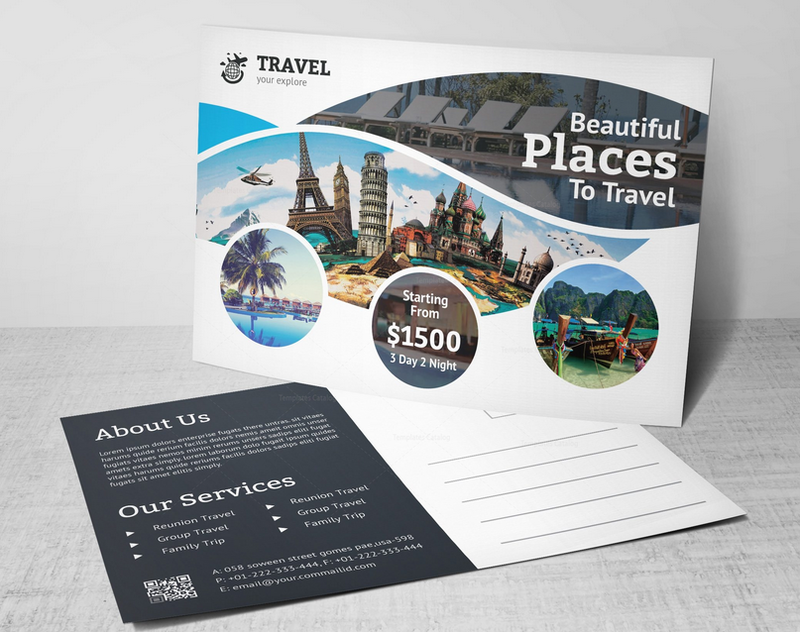 And if you still haven’t finalized your postcard design, you can easily choose from their over 10,000 templates or get help from one of their professional designers. This postcard is used to send out invitations to target clients asking them to attend your sponsored seminar or conference. Include a special discount code and your website address where they can register for the event. 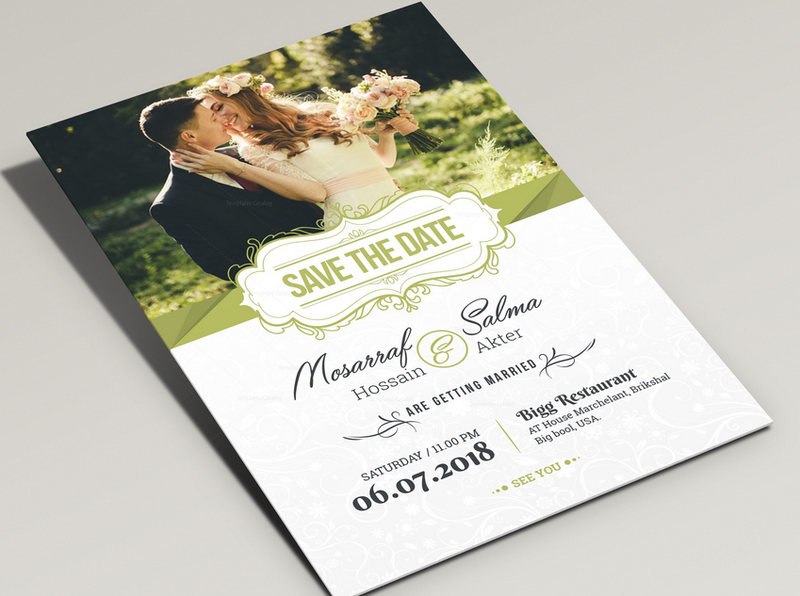 Save the date postcards are great as a complement for a wedding event website. This free postcard template uses a sleek elegant design for a classic wedding theme. Make sure your website is mobile-friendly if you are going to include a matching QR code. When using postcards to feature your new destination offering to clients, consider going with a theme. The unique frames for the image on this template reminds you of the sun and waves, so when added with the right color background, will work great for a beach destination. Real estate announcements are naturally image-heavy to feature properties that they want to sell. Keep the colors cohesive on both the front and back without taking the focus away from the image or making the text difficult to read. 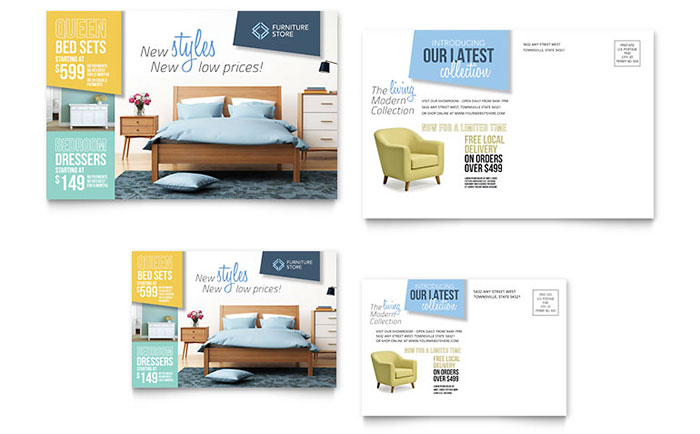 A catalog-style format on postcards is used to advertise sales of a number of products. This also includes advertising discounts and special events to invite the recipient to visit the shop. 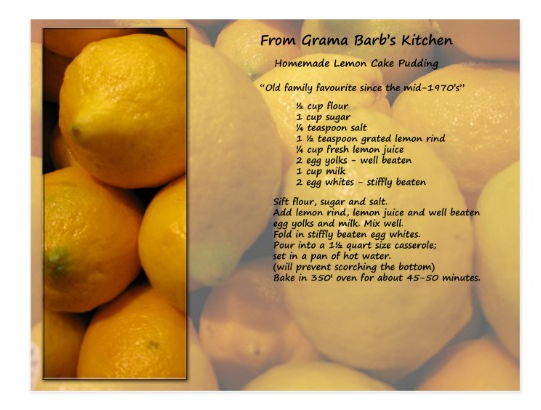 We love how the layout makes the postcard look clean even when it’s loaded with images and text. This template is for reminding clients to renew their insurance. 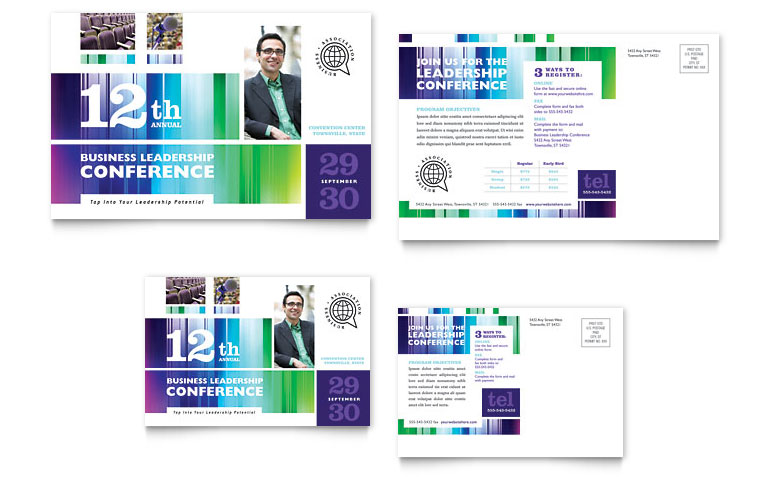 The design and layout are simple and very straightforward, making sure that the message is clearly delivered. Consider making use of an image that reminds your client what the insurance is for. Showcase your skills in manipulating light effects. This postcard template lets you turn your favorite photo into a whimsical image that provides an overall vintage feel to your postcard. Display your creativity with the lens in this template. Play with colors and shapes to customize your image. A burst of color helps in expressing one’s style. 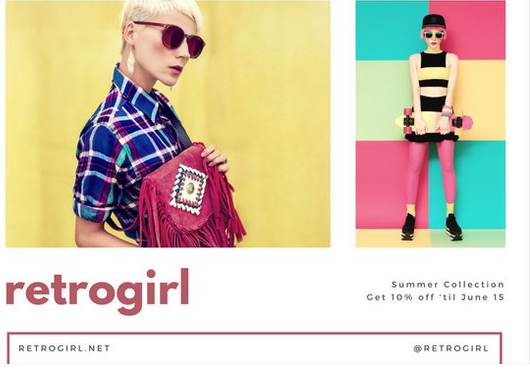 Announce a sale with this eye-catching retro design and include a special discount to make your postcard irresistible. Use this template for a clean, simple layout and maybe add a space for a handwritten message for an even more personal touch. The warm yellow and orange color scheme can easily be changed to fit your brand. Add your message and contact details using the elegant font that’s attention-grabbing but still complements the delicate feel of the design. 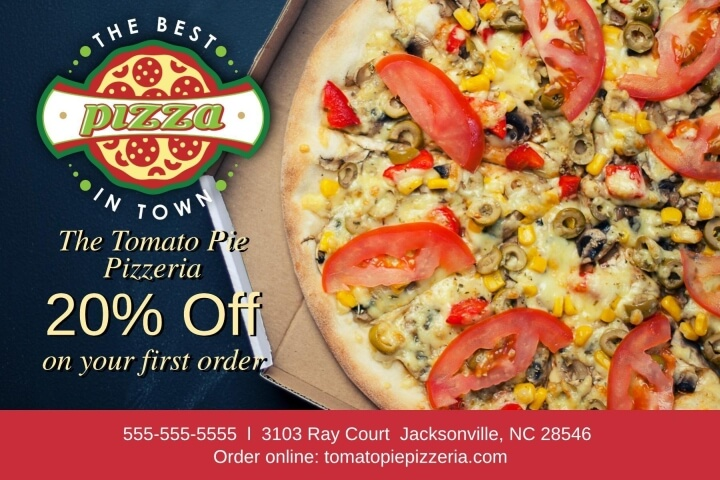 Want to sell your not-so-popular pizza on the menu? Send out postcards! 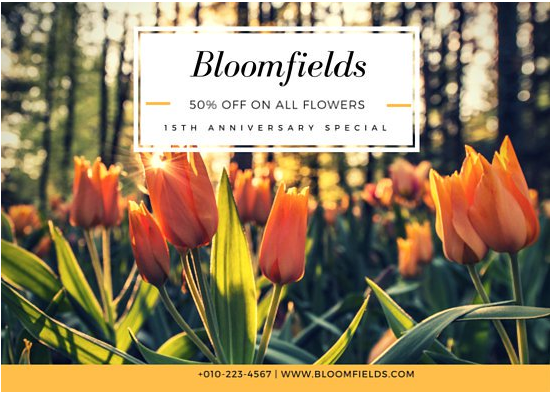 Add one large, high-res image of your product and eye-catching font for your special discount plus a phone number to get your customers calling in their orders. Great way of making sure your audience will welcome your mail and look forward to more. 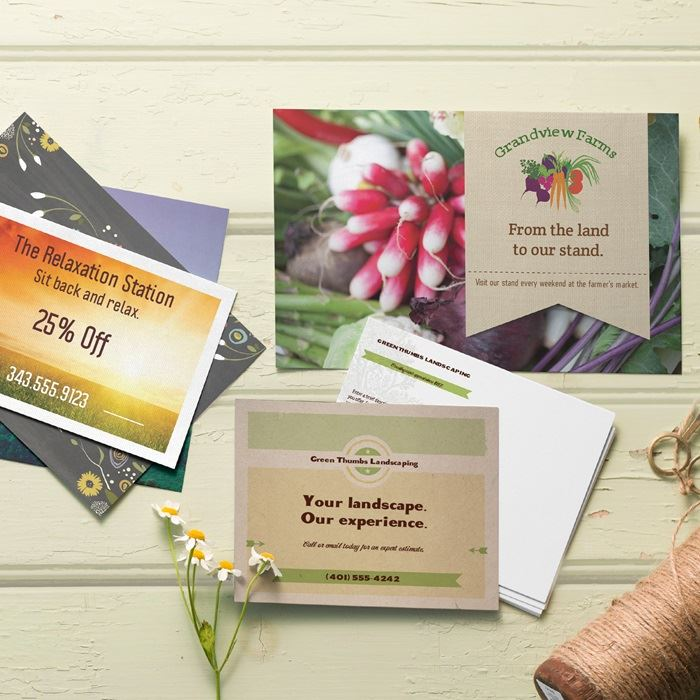 Your clients will love getting coupon saver postcards. 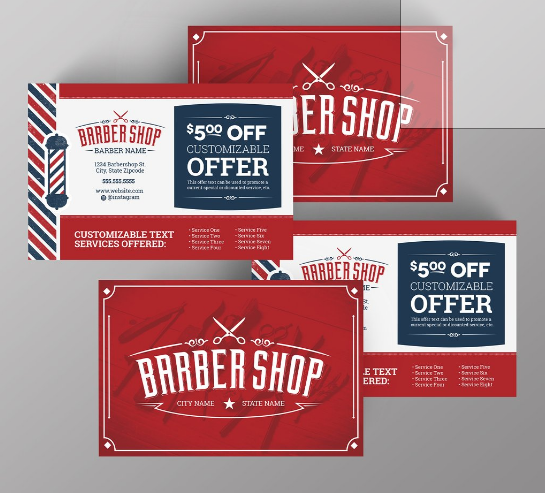 This template works great for businesses like a barbershop or salon if you want to surprise your clients with special discounts. 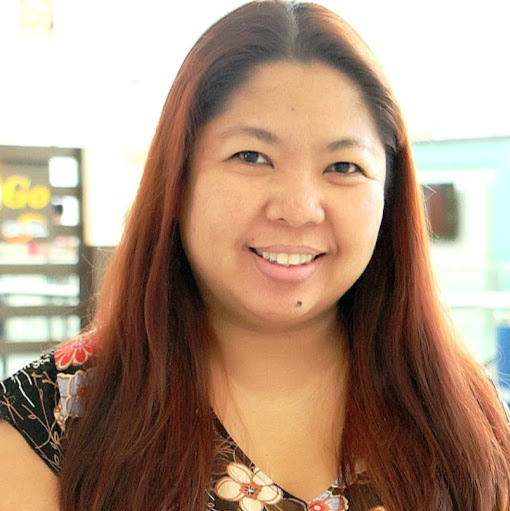 Send it out in time for special occasions or holidays to make it even more special. 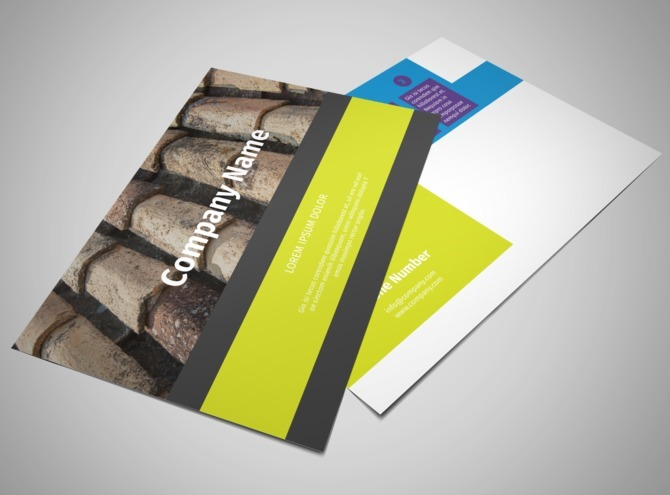 Use your postcard to show clients the potential of hiring your services. 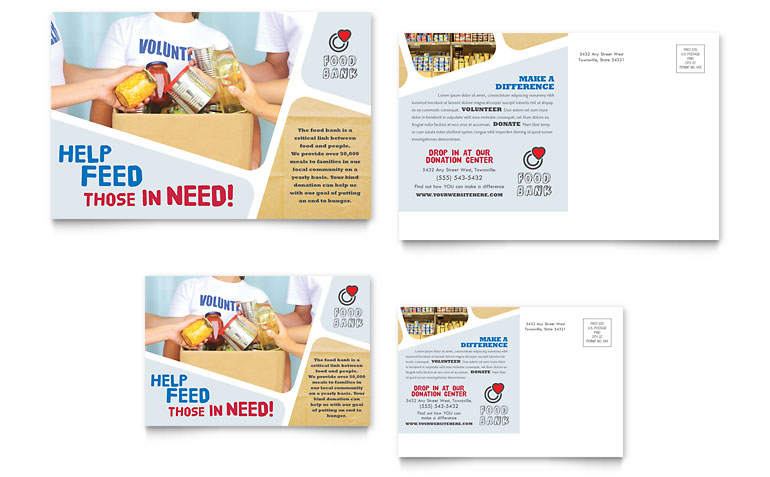 This postcard template uses the before-and-after approach to inspire clients to give you a call. Note how a smaller panel can be used to show the “before” image while the “end look” occupies the rest of the space. 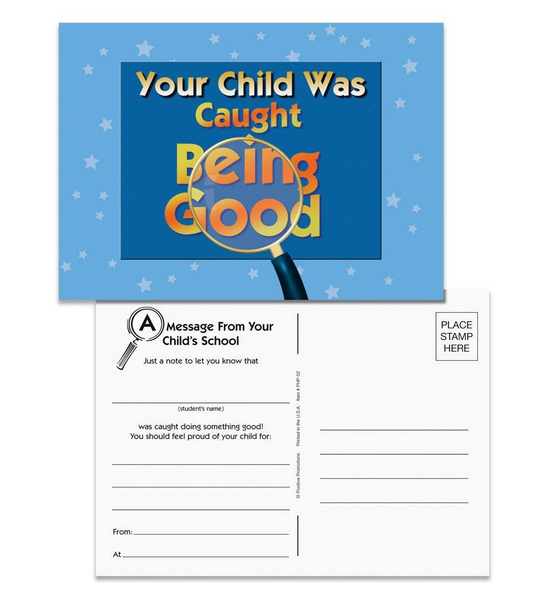 A fun alternative to letters, this postcard template is a great way to get parents involved in their children’s progress in school or day care. Take a photo of their child in action and then include a link to your social media’s photo gallery, where parents can see them in action. Notice how this template uses text instead of the image to draw the audience in. The secret to this design is a striking image to draw the reader in. It also has a great layout and copy where the message can shine and be clearly visible from afar. A very simple but eye-catching design. 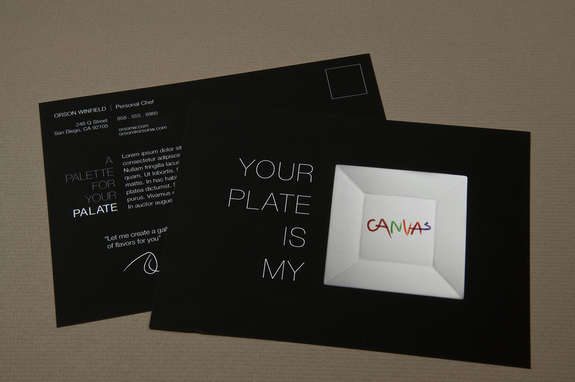 This template gives a lot of room for creativity—perfect as postcards for cooking schools. Replace the image with a high-res photo of your own dish and add your logo for a more authentic look. You can also add a short caption at the front and details of your cooking class schedules at the back. An artistic approach for a catering postcard. This template gives its audience a sense of open possibilities that can be intriguing and reason enough to pick up the phone and give the business a call. This works best if your catering business offers personal chef services to clients. 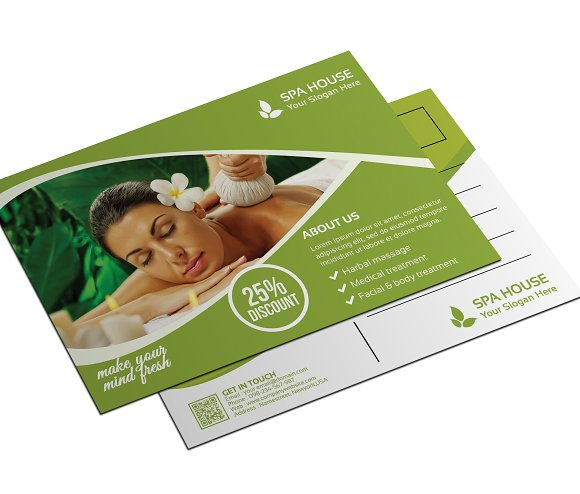 This spa postcard template makes use of a single color to evoke calm. The sharp colors are replaced with a muted tone, and, along with the image, entices the audience to experience their service. How can anyone say no to a pretty image of one’s pet in a postcard? This appointment postcard is simple but manages to relay its message while keeping a fun vibe. 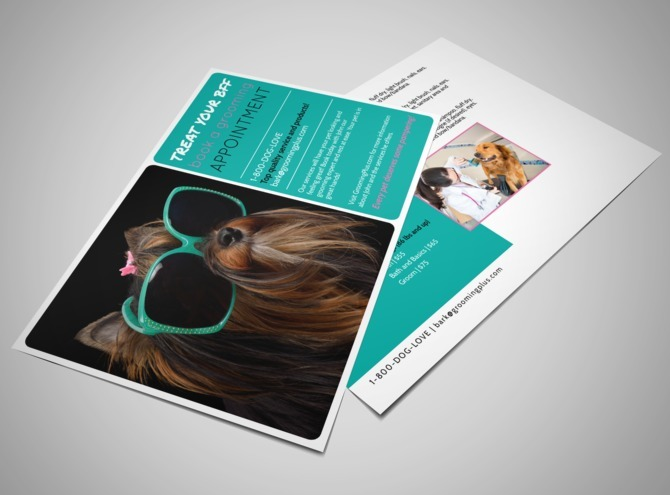 If you’re willing to spend more, you can turn it up a notch by using an actual photo of your client’s pet in the postcard. 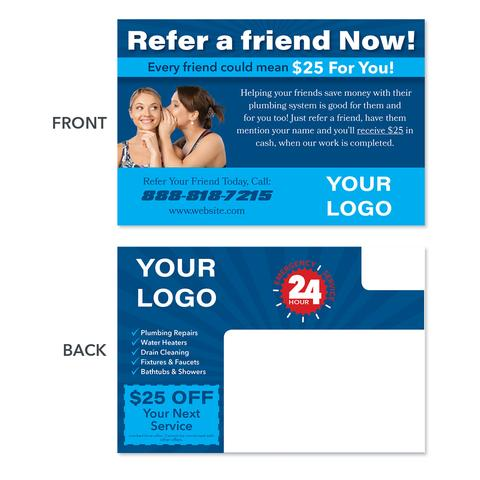 A referral postcard can get your plumbing business more opportunities to gain clients. This template uses a very simple layout, but the design is eye-catching and on-point. Colors and sizes are used on fonts to emphasize important information like phone number, discount, and offers. When you send your clients a notice that you have moved to a different address, it’s important to remind them where your previous address was. 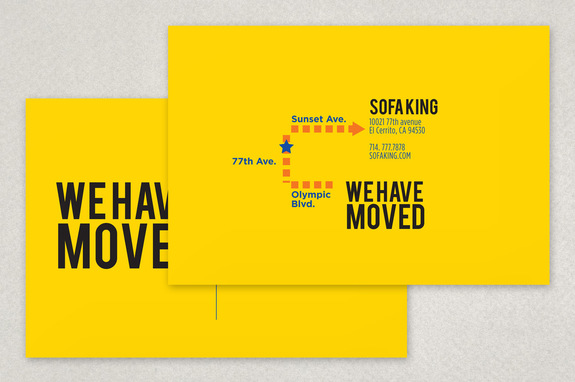 Aside from the eye-catching color, we also love how this template used minimal design yet still managed to explain clearly where they moved from and where they moved to. The secret to a successful postcard for your campaign is to make sure to send them out early and explain your cause clearly. 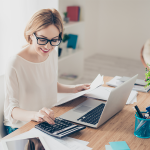 Schedule pick-up dates and include a phone number that your recipients can call once they have their contributions ready. You might also want to include a discount on the postcard to those who participated. 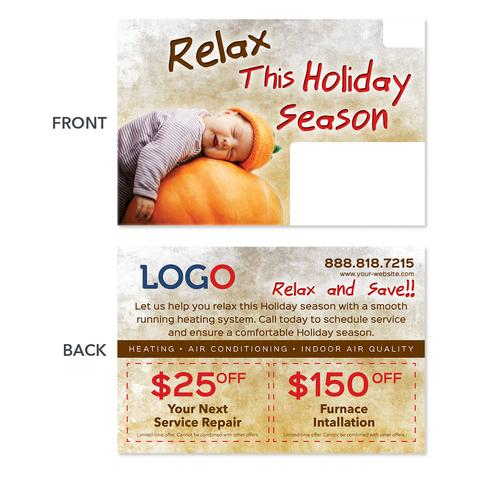 You’ll find most HVAC contractors will be offering similar discounts, but this postcard example makes use of interesting image and copy to stand out. The example immediately answers their clients’ problems while also providing added value in the form of a discount. One way to make your birthday postcard special is to print the recipient’s name. 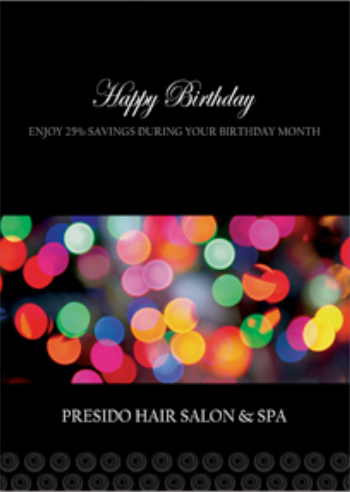 You can also add a detachable birthday coupon or discount card. The interactive approach adds to the exclusivity and value of your brand while earning your client’s loyalty. It’s important that your postcard supports the service that you offer. 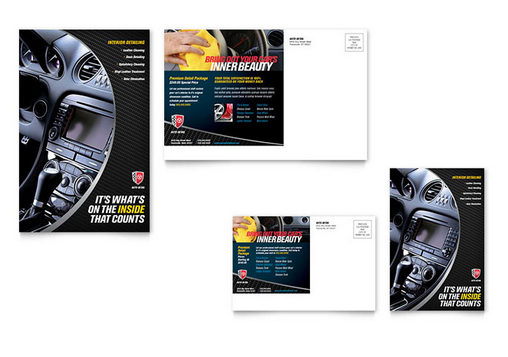 Note how this postcard template uses close-up images and keywords like “inside” and “inner beauty” to emphasize their brand. 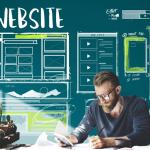 These elements will draw the audience in to find out more about your services. We can’t expect our audience to read a long paragraph just to get the message across. This postcard template uses a pair of title and image that briefly explains the objective of the postcard. Choose a high-res image of the event from the previous year and provide a short introduction to what it’s about on the back. 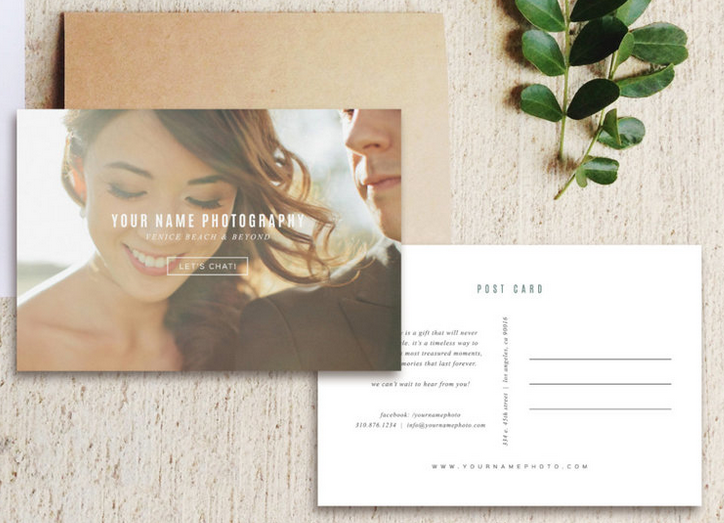 There are a lot more postcard templates available out there, but these are clear favorites and might just work for you too. 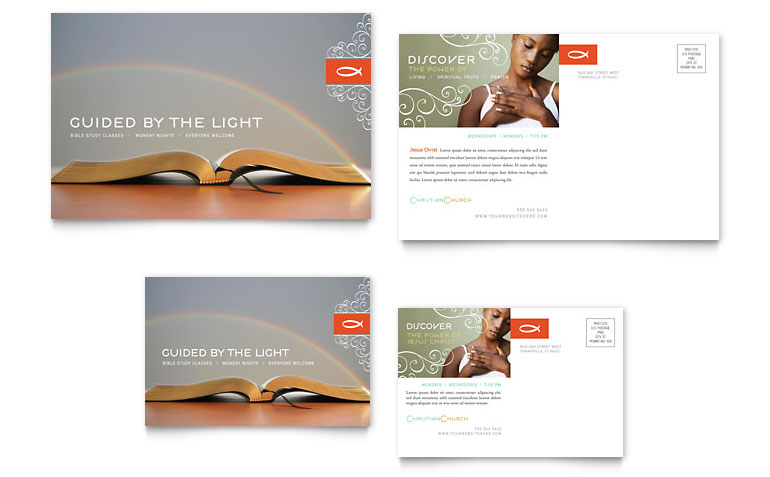 So which one of these postcard templates is your favorite? Have other paid and free postcard template you like? Let us know in the comments below. Waoooo, very cool postcards. I liked the business card most. thanks again. Thanks Amin, glad you liked the article!